Matt suggested I call this Big League Stew, in honor of the Phillies game tonight. Go Phils! 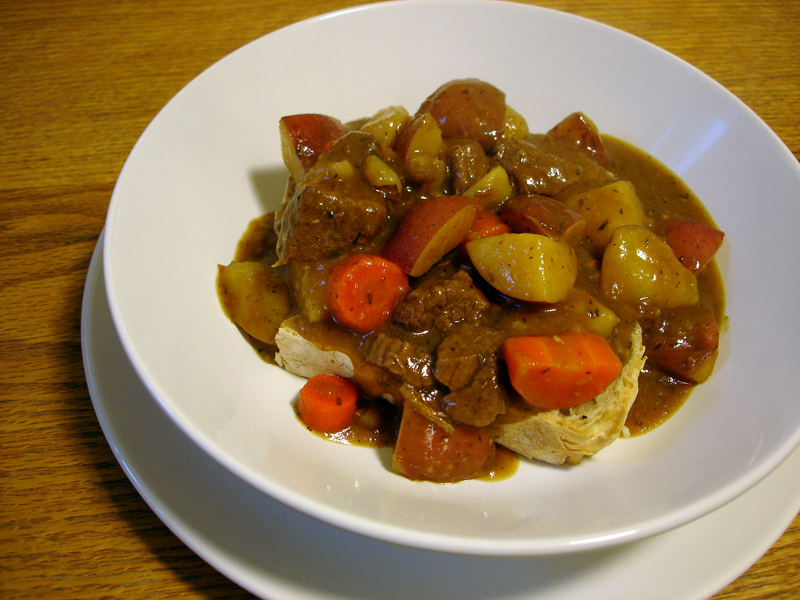 This stew was very loosely based on the Irish Beef Stew from Simply Recipes, but I didn’t really follow it at all. I just needed a general idea to get started, and the end result was just fantastic. I served it over toasted slices of no-knead bread that I made again yesterday. I know I’ll be making this stew all winter. And look! We finally got some new plates! Heat oil in a dutch oven over medium-high heat. Season beef with salt and brown on all sides. Add onion and cook for a couple minutes, then add garlic and cook another minute. Add tomato paste, thyme, bay leaves, brown sugar, Worcestershire sauce, and beef stock. Stir to combine and bring to a boil. Reduce heat, cover, and simmer for about an hour. Add the carrots and potatoes and simmer, uncovered, until very tender, about 40 minutes. Taste the broth and add salt and pepper as necessary. To thicken the broth, mix flour with about 1/2 cup water and stir into the stew. Bring to a boil and cook until thickened. Serve over toasted crusty bread or biscuits.